A drag racer crossed with a fighter jet. That’s the claim. That’s some pretty serious marketing-speak coming from our friends in Milwaukee. The FXDR 114 is something like a mashup between the Motor Co.’s dearly departed Dyna and V-Rod model lines. A brutish power cruiser that can still thrill when the going gets twisty. How does it hold up to those claims? Well, we went to Harley-Davidson’s hometown to find out. In reality, we had met up in Minneapolis to ride the 2019 Touring and CVO models to Milwaukee for Harley’s 115th-anniversary celebration. 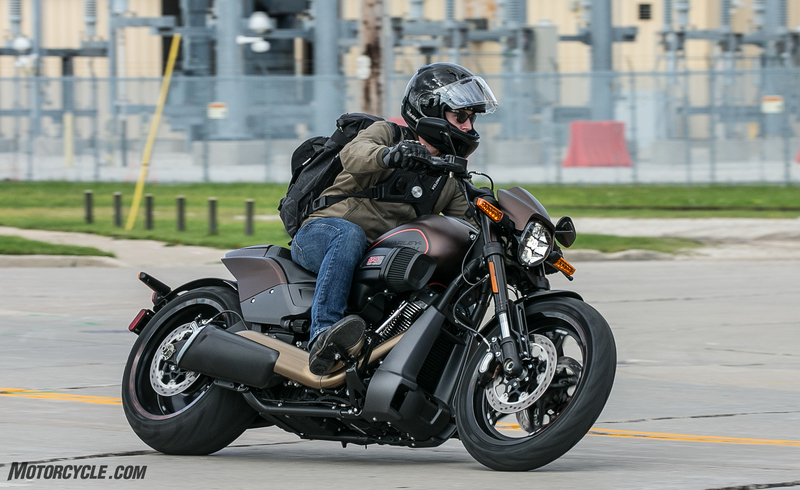 I had no idea we would get to spend a few days bombing around Milwaukee and the surrounding area on H-D’s new drag racing jet fighter, but I was pleasantly surprised to have the opportunity to do so. The FXDR’s tank holds 4.4-gallons, which is just fine because you probably won’t want to be sitting on it long enough to burn through a full tank. The first thing that’s noticed when laying your eyes upon the all new FXDR 114 is the stance, followed by the quality finishing found on the motorcycle. The 34 degree rake of the inverted fork, 240 rear Michelin Scorcher 11, composite rear fender, and large intake exude dragstrip-inspired style while the angled exhaust hints at the claimed 32.6 degrees of lean angle on the bike’s right side. The FXDR’s 18-inch disc-type cast aluminum rear wheel and svelte 19-inch cast aluminum front wheel also add to the drag-bike styling. A bike like this with such slim styling makes the big ol’ Milwaukee 8 114cu in engine stand out as the star of the package, and we aren’t complaining. The FXDR is available in six different colors; Vivid Black, Black Denim, Industrial Gray Denim, Wicked Red Denim, Bonneville Salt Denim, and Rawhide Denim. That’s more denim than JT and Britney at the 2001 American Music Awards (Google it). 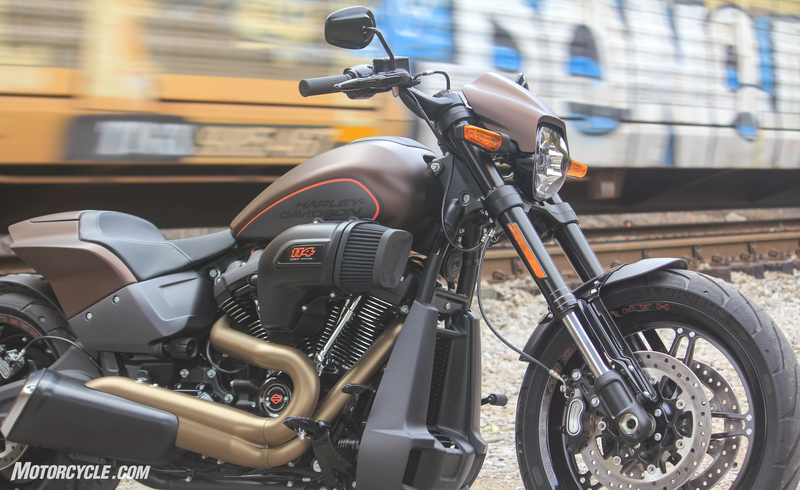 Denim denotes a matte finish in Harley’s paint colors, and they do look great with the matte bronze-finish found on the two-into-one exhaust. 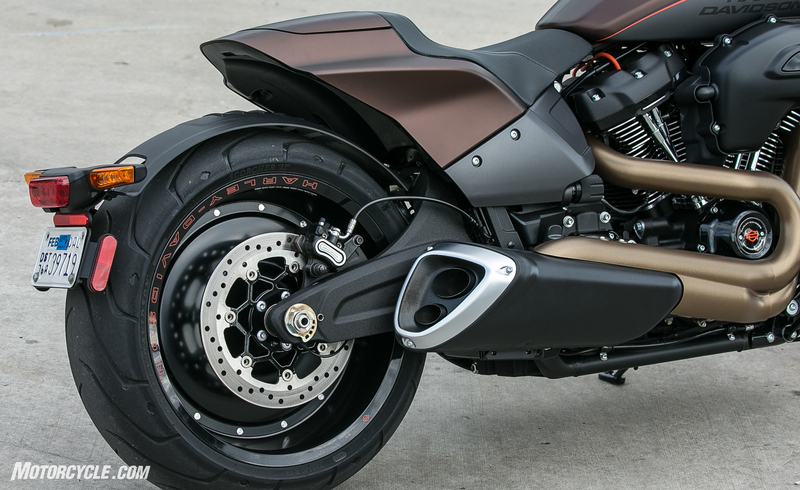 An exhaust that Evans Brasfield once described as “a mating pair of bronze pythons” on the 2018 Fat Bob. 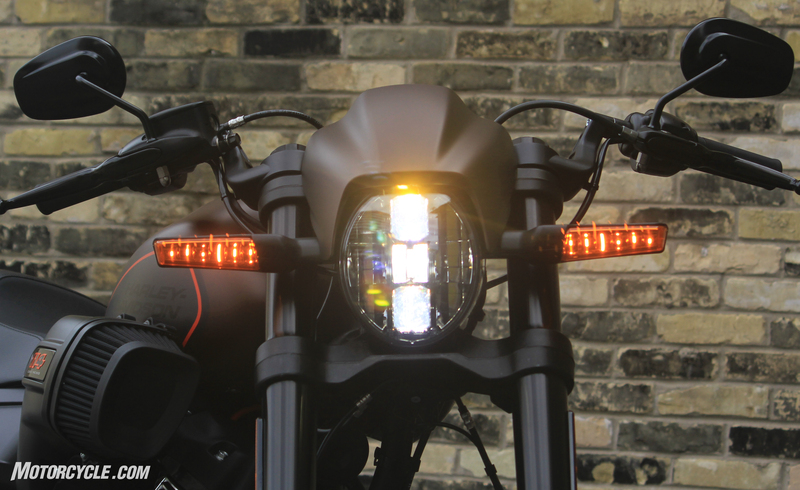 The LED Daymaker headlight shines bright and looks great with the modern-styled LED turn signals on each side. From the front, the FXDR maintains it’s uniquely modern drag bike styling with a slim-looking profile. The Daymaker LED headlamp, flanked by long straight LED turn signals and topped with a small cowling, keeps the front end looking minimalist. Behind the cowling sits a small modern-but-austere digital display giving you a surprising amount of info for such a small screen without feeling crowded. Below the display sits a standard light bar with warning, neutral, ABS, and other light up icons. The FXDR’s branding is subtle but iconic in its application. The “clip-ons” of the FXDR are massive girthy machined aluminum components that wrap around the bike’s 43mm fork tubes and then rise up to put the handlebars in a mostly upright riding position while still keeping the rider in a position reminiscent of H-D’s drag bikes. 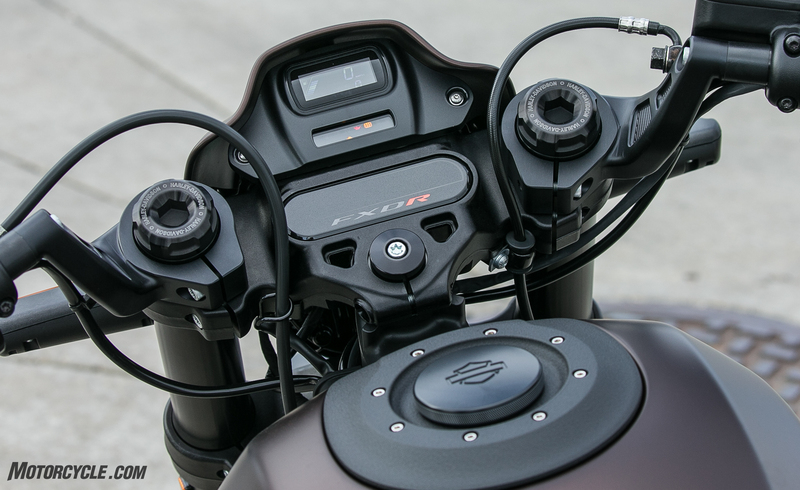 The seat is wide and comfortable, giving a rider of my size room to move fore or aft, and provides a good stop from the rider sliding back should they want to tap into the claimed 119 lb-ft of torque. We had the chance to dyno the 2018 Fat Bob during our Bruiser Cruisers comparison, which shares the 114 cu in engine with the FXDR. That engine produced 82.3 horsepower and 103.9 lb-ft of torque at the rear wheel. 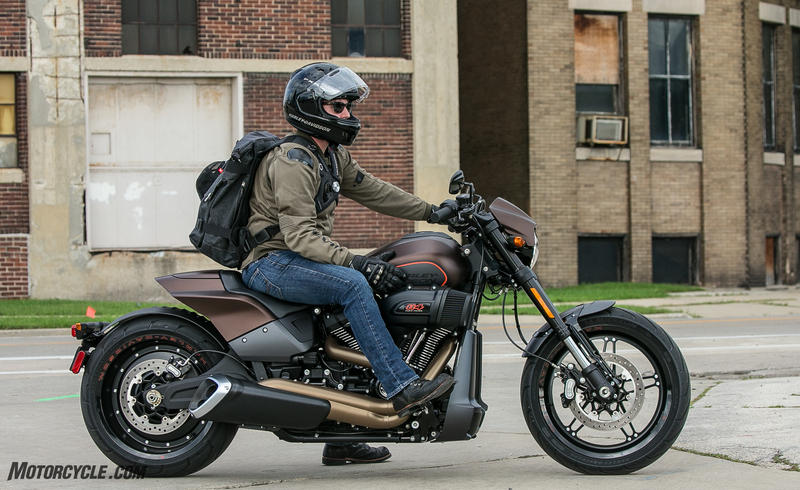 With that kind of torque, and if your plan is to actually drag race the FXDR, you’ll appreciate the clamshell riding position as you cling on while the 240 rear tire strains to grip the pavement as you release the clutch. If you’re cruising around town with frequent stops, the riding position still isn’t bad – but be realistic with your intentions. 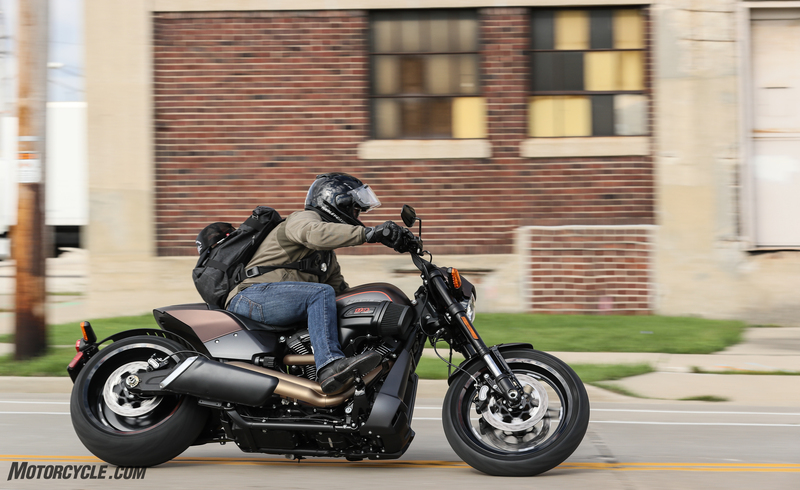 This isn’t a touring bike, and models like the Fat Bob are much more upright and comfortable for longer rides. The rear tire-hugging fender looks like it would do a great job to keep your back dry in the rain. It doesn’t. Harley-Davidson claims the FXDR benefits from performance gains by shedding weight and using lighter componentry than previously found on the Softail line. The FXDR’s swingarm, for example, is a 13.8-pound cast aluminum piece rather than the typical stamped steel unit found on other Softail models which weighs in at 24 pounds. Much to Sir Mix-a-lot’s dismay, the FXDR has also undergone weight savings in the rear. The use of an aluminum trellis-style subframe and composite fender has dropped 7 pounds H-D says, when compared to other steel fenders used in the lineup. 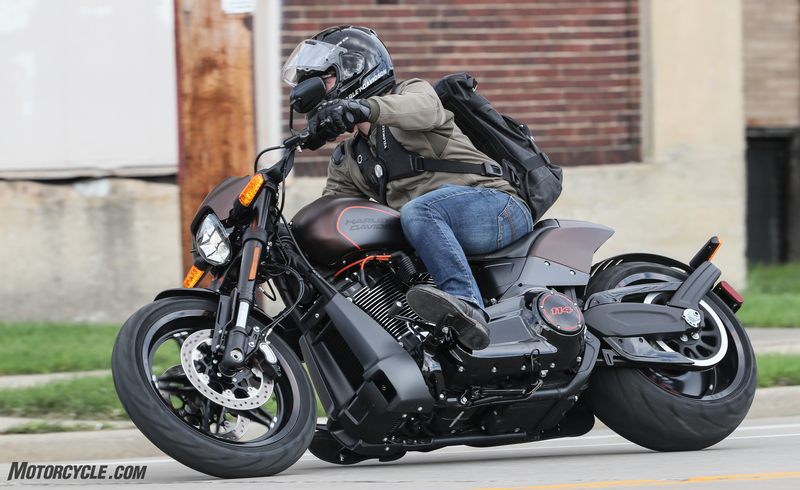 Harley-Davidson claims a curb weight of 668 pounds for the FXDR 114. So how is it to ride? Well, the seating position is preferred when hammering the throttle for high-speed launches – whether at the drag strip or stoplight. The 1868cc rigid-mounted V-Twin is a blast around town with the majority of its torque available before 3,000 rpm and comes on incredibly smooth. The EFI on all of the Harley-Davidsons I rode throughout the past week have felt like some of the best fueling I’ve tested. The big V-Twin is mated to Harley’s six-speed Cruise Drive transmission which provides positive clunks when shifting into gear with no slop. The 68.4 inch wheelbase and 34 degree rake help the four-piston dual 300mm rotors do their job stopping the bike in a straight line. They also feel solid when being modulated during lean. ABS is standard and not intrusive at the lever when it reins things in. How does this long raked-out, fat-tire havin Harley steer? Probably better than you’d expect, but it’s no sportbike. A brief conversation with a Harley-Davidson engineer described what they had been tasked with, “We want a raked out bike with a huge rear tire that handles well and has exceptional lean angle.” Umm, okay. There’s no denying when consulting other journalists who have spent more time than I on V-Rods and other custom cruisers, the FXDR does handle well and has plenty of lean angle, but at the end of the day, a “drag bike” won’t be the best handling motorcycle. The 240 rear radial Michelin tire isn’t doing any favors for the FXDR’s handling around the bends. The bike feels incredibly stable while spinning the rear up through third gear in the rain, mostly due to its limousine wheelbase, but in tight corners and around stop lights in town, the massive rear tire still causes the bike to want to stand itself up. Without access to longer sweeping corners found in some of our favorite roads in California, I really can’t attest to the bike’s handling during high speed switchbacks – the Midwest is mostly devoid of those kinds of spaghetti strewn lengths of pavement. The single cartridge 43mm front fork uses a triple-rate spring to keep the front end compliant during normal riding as well as hard braking and, in theory, everything between, which we were unable to test at this time. There is no adjustment for the front suspension. The rear uses a coil-over monoshock with 3.4 inches of travel and is equipped with a knob for easily adjusting preload. The FXDR’s massive intake is intriguing and fun to listen to, though I heard mutterings from my fellow riders that it was just a bit too massive and would likely be one of the first pieces to be replaced if they were to buy the bike. The FXDR is a fun bike to ride. It has a fantastic motor with loads of torque available at low rpm, making it a blast to ride around town. Harley claims a lean angle of 32.6 degrees on the right and 32.8 degrees on the left. For a cruiser, that’s solid lean angle, though to use it all, your heels will need to be on top of the footpegs. The FXDR starts at $21,349 making it the most expensive Softail in the line.